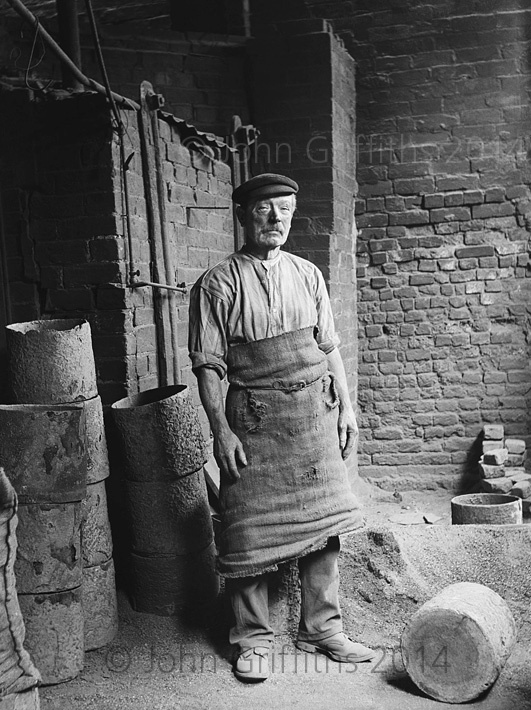 Arthur Farrington’s portrait of an unknown worker in the annealing shop at Eylands, c.1905. With the possible exception of Thomas Gameson Limited, Eyland & Sons Limited of Lower Rushall Street is up there as being one of Walsall’s oldest companies. Founded in 1760 by Moses Eyland as a manufacturer of buckles and spectacles the company quickly established itself in the town and grew rapidly. The Eyland family severed their connections with the business in the early part of the twentieth century and the Farrington family, related to them by marriage, took over the running of the company. Managing Director was Charles Farrington whose mother, Mary Ann, was an Eyland as was his wife, Marie. The Farrington’s were a well-known family in the town whose principle business interest was that of auctioneers. Also involved in the running of Eylands were the two younger brothers of Charles, Arthur and Frank. Frank was later to become Works Manager and Arthur was the Chief Cashier. 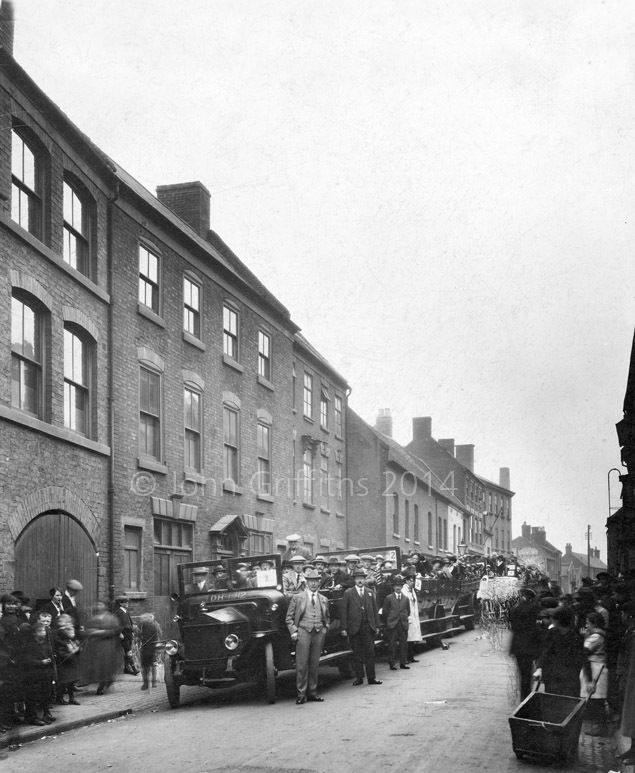 Both younger brothers were keen amateur photographers and were members of Walsall Photographic Society. It seems that Arthur was possibly the keener of the two photographers as it is the images from his glass negatives that illustrate this post. 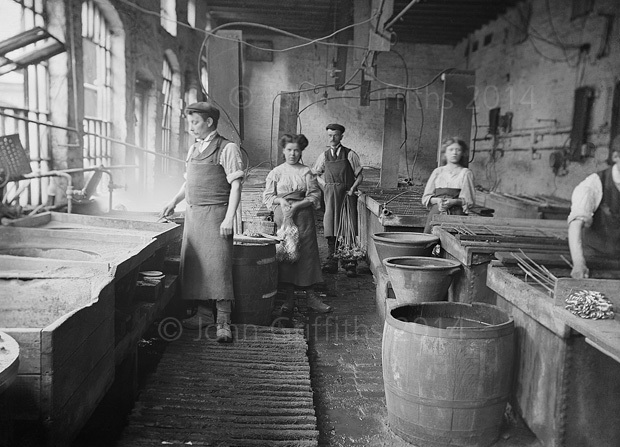 Arthur produced a set of photographs taken around the Eyland factory circa 1905 and the image of the unknown man above, who worked in the annealing shop, is for me one of the finest portraits of a Black Country working man that you will see. The premises of Eyland & Sons is to the left of the picture which shows the work staff about to depart on a trip to Evesham in a fleet of charabancs. My grandfather, Billy Moseley, is seated at the left rear of the first chara’ and directly in front of him with the moustache and dark suit is Charles Farrington. 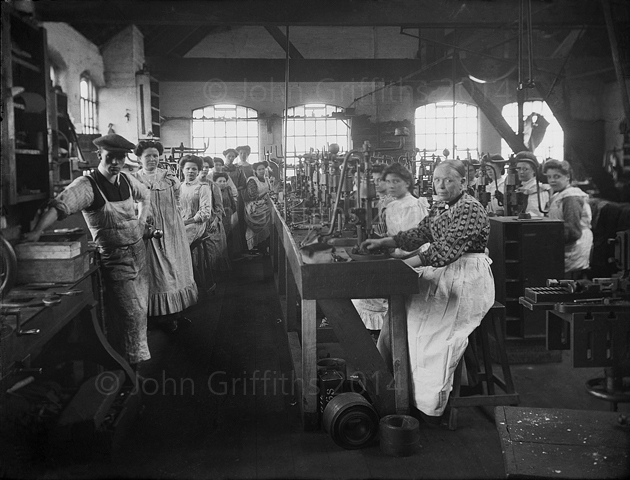 The electroplating shop at Eylands. Bubbling vats of electrically charged chemicals and the only protection for the staff is an open window! The wire shop with the staff standing smartly to attention. 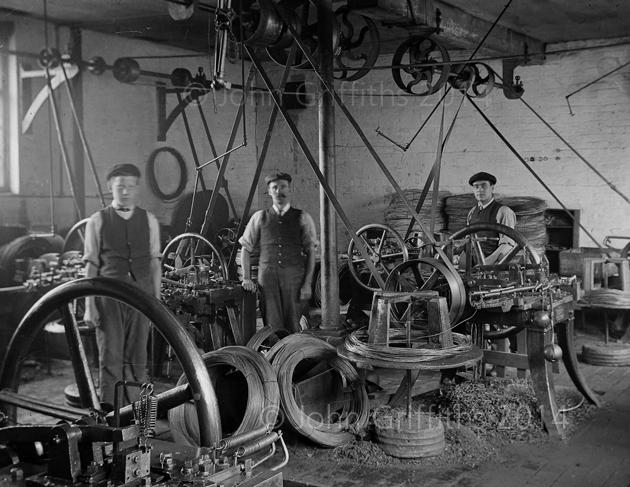 The press shop staffed by nearly all women. I hope that lad at the front was thick skinned! 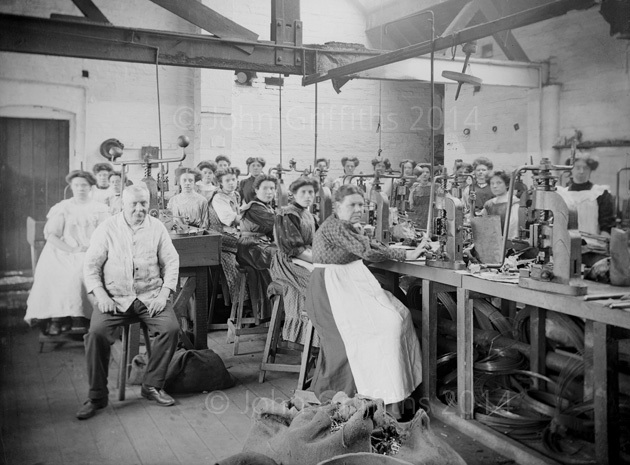 Nearly all ladies and girls again but this time in the assembly shop with a very weary looking foreman in the foreground. 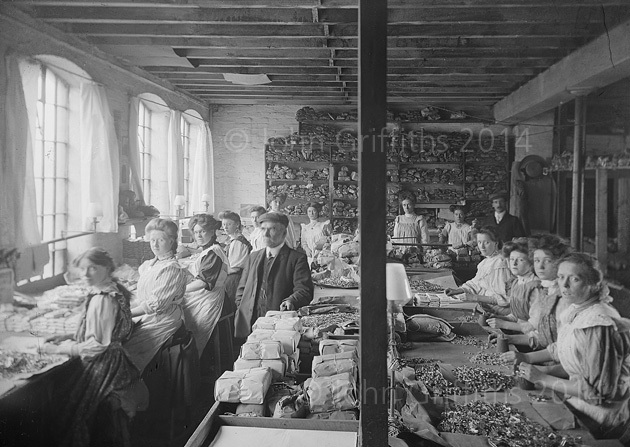 The packing shop, again staffed predominantly by women and girls. In later years the Managing Director was John Webster, he sent my grandfather the letter below thanking him for his service of over 35 years. It seems the feeling was mutual as I can remember being told by my grandmother and mother what a good company they had been to work for. Incidentally, John was the brother of Walsall’s famous pilot, Sidney ‘Pebbler’ Webster. 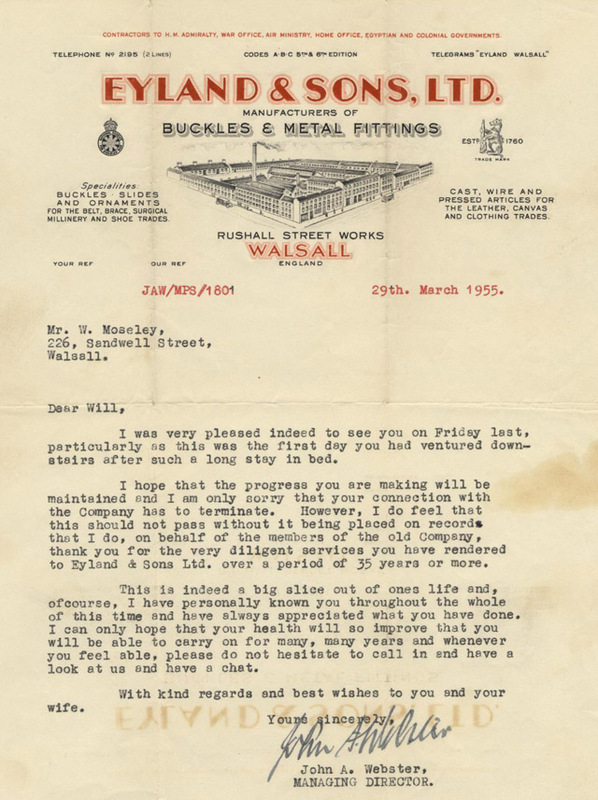 The letter sent to my grandfather William Moseley thanking him for his long service. A year later, almost to the date on the letter, he died and because of that sad event I began supporting Walsall FC but that’s another story! By the mid 1980s the building on Lower Rushall Street was standing empty, the business had been scaled down and moved eslewhere, over two hundred years of industrial history had gone. In the 1990s the building was later renovated and converted into apartments and on completion looked rather smart but twenty plus years and they now look in need of more work. Whilst researching for this post I typed “Eyland” into Google and the name magically appeared again under the banner of F. H. Tomkins Buckle Co. Ltd of Brockhurst Crescent, Walsall. So the name survives if little else. You are currently reading Eyland & Sons Limited at Walsall Life.